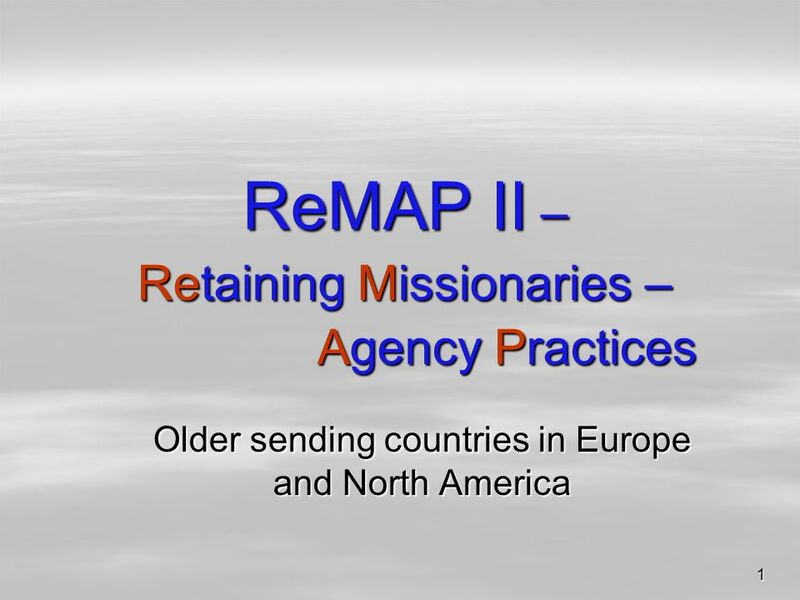 1 ReMAP II – Retaining Missionaries – Agency Practices Older sending countries in Europe and North America. 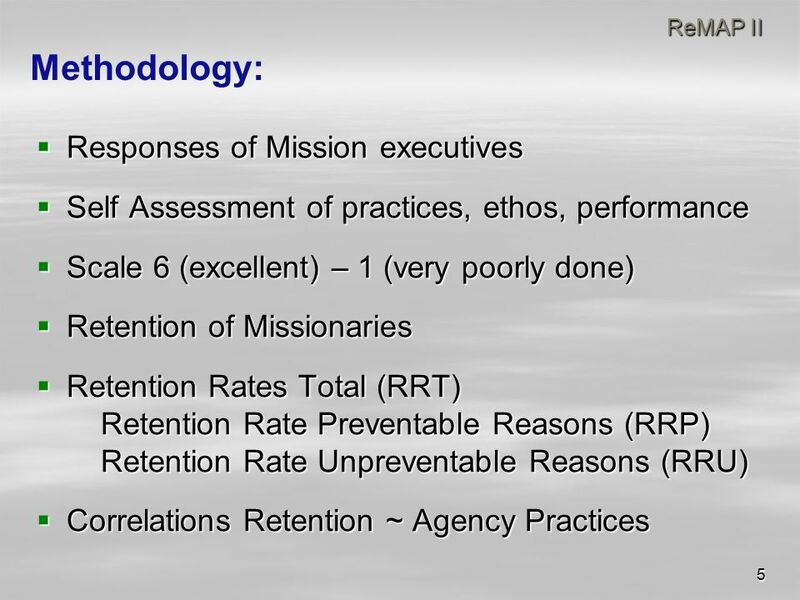 2 2 ReMAP II was a follow-up study on: ReMAP – Reducing Missionary Attrition Project World Evangelical Alliance (WEA) Mission Commission 1994-96 Why do missionaries quit service? Why do they come home prematurely? In particular, what are personal factors for attrition? 3 3 ReMAP II What makes missionaries prosper? What helps them grow into a fruitful ministry? What makes them effective? How do they become resilient Which organisational factors make them thrive? 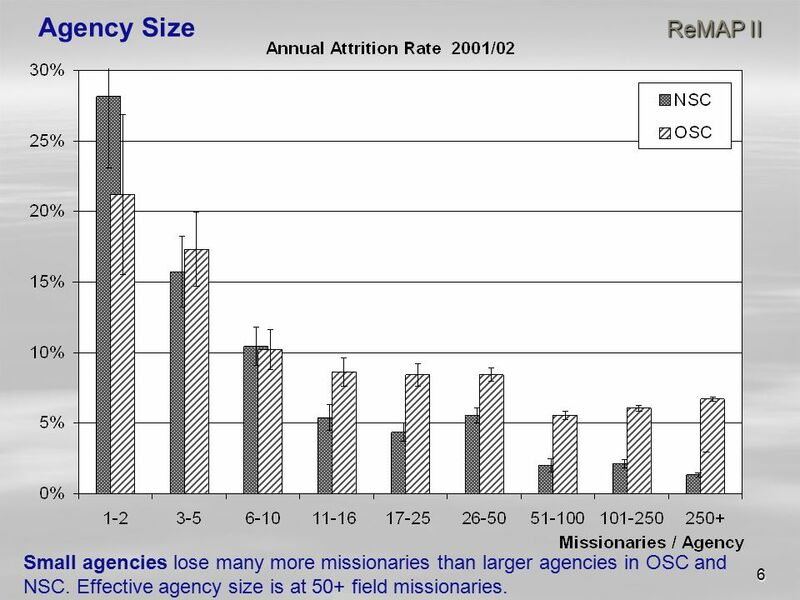 6 6 ReMAP II Agency Size ReMAP II Small agencies lose many more missionaries than larger agencies in OSC and NSC. Effective agency size is at 50+ field missionaries. 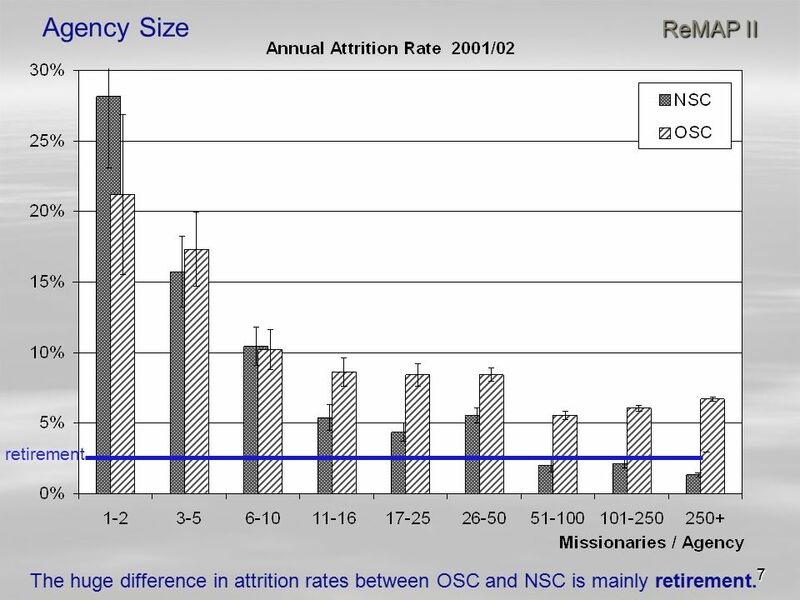 7 7 ReMAP II Agency Size ReMAP II retirement The huge difference in attrition rates between OSC and NSC is mainly retirement. 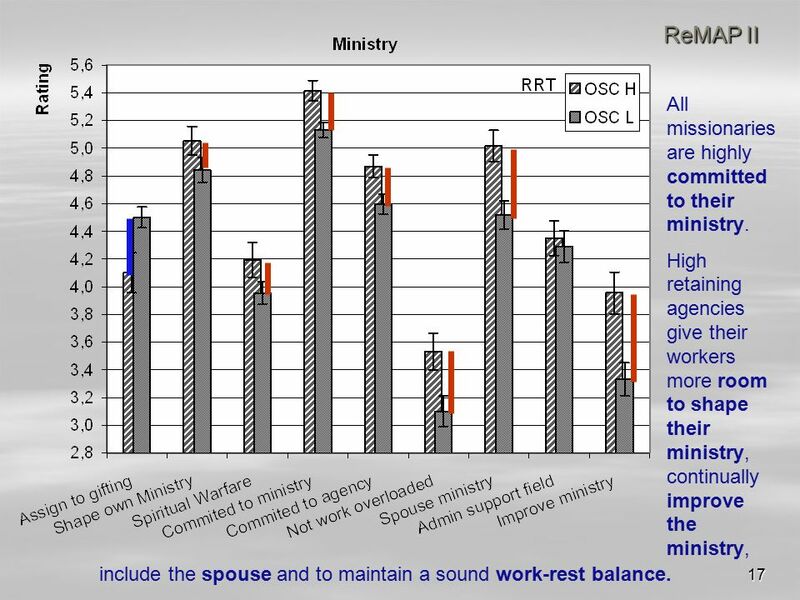 8 8 ReMAP II Agency Size ReMAP II Small agencies in OSC and NSC have a much higher percentage of staff in their home office (per active missionaries). They are neither effective nor efficient. 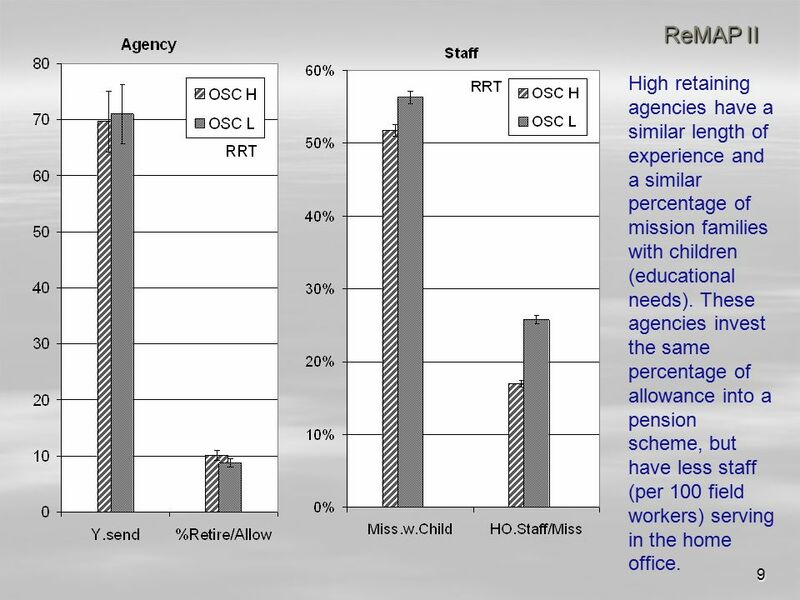 9 9 ReMAP II High retaining agencies have a similar length of experience and a similar percentage of mission families with children (educational needs). These agencies invest the same percentage of allowance into a pension scheme, but have less staff (per 100 field workers) serving in the home office. 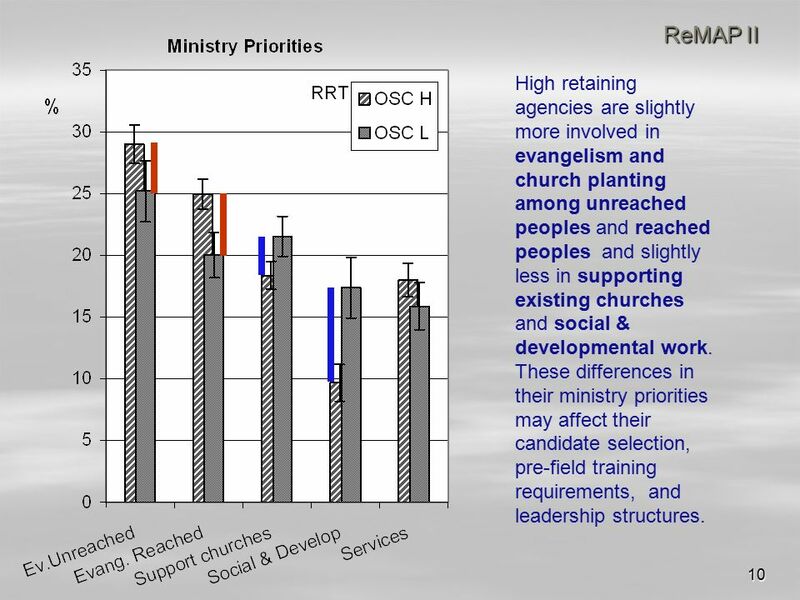 10 10 ReMAP II High retaining agencies are slightly more involved in evangelism and church planting among unreached peoples and reached peoples and slightly less in supporting existing churches and social & developmental work. 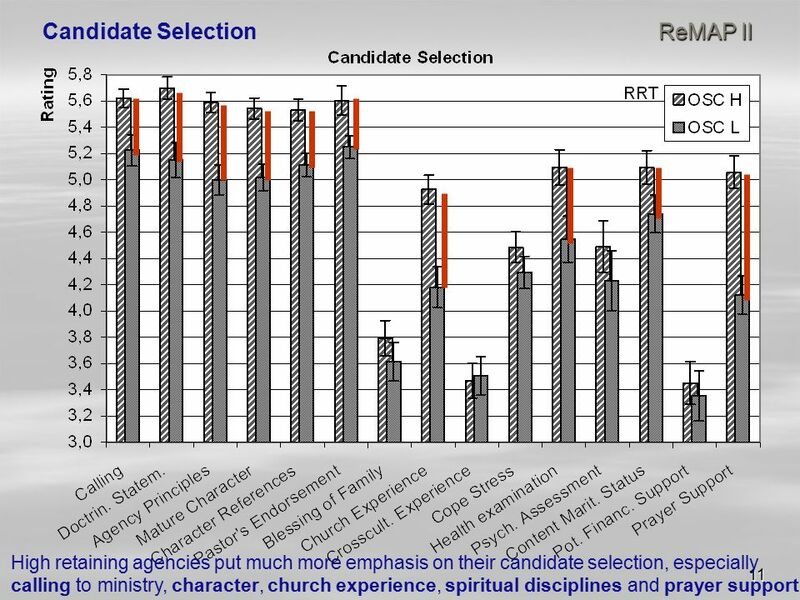 These differences in their ministry priorities may affect their candidate selection, pre-field training requirements, and leadership structures. 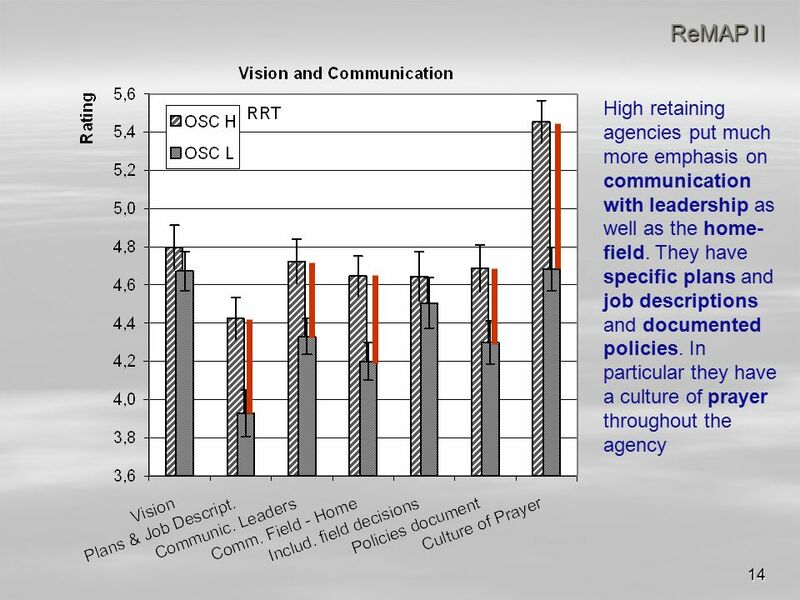 12 12 ReMAP II High retaining agencies have missionaries with higher academic training. 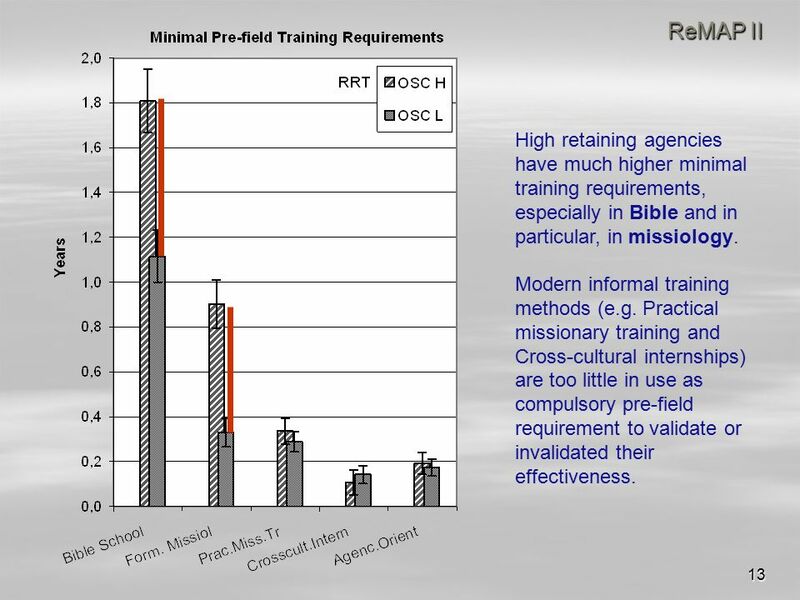 13 13 ReMAP II High retaining agencies have much higher minimal training requirements, especially in Bible and in particular, in missiology. Modern informal training methods (e.g. Practical missionary training and Cross-cultural internships) are too little in use as compulsory pre-field requirement to validate or invalidated their effectiveness. 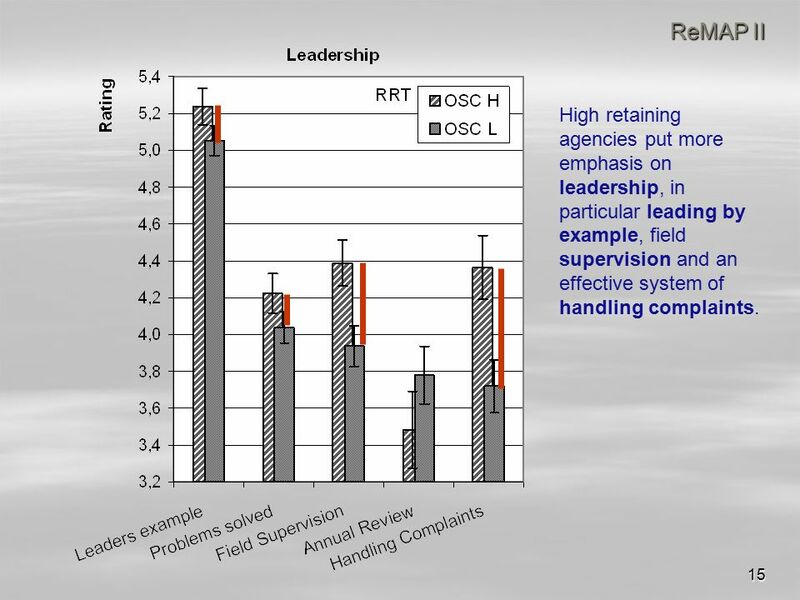 15 15 ReMAP II High retaining agencies put more emphasis on leadership, in particular leading by example, field supervision and an effective system of handling complaints. 16 16 ReMAP II Language and culture learning is generally considered as a lifelong task. 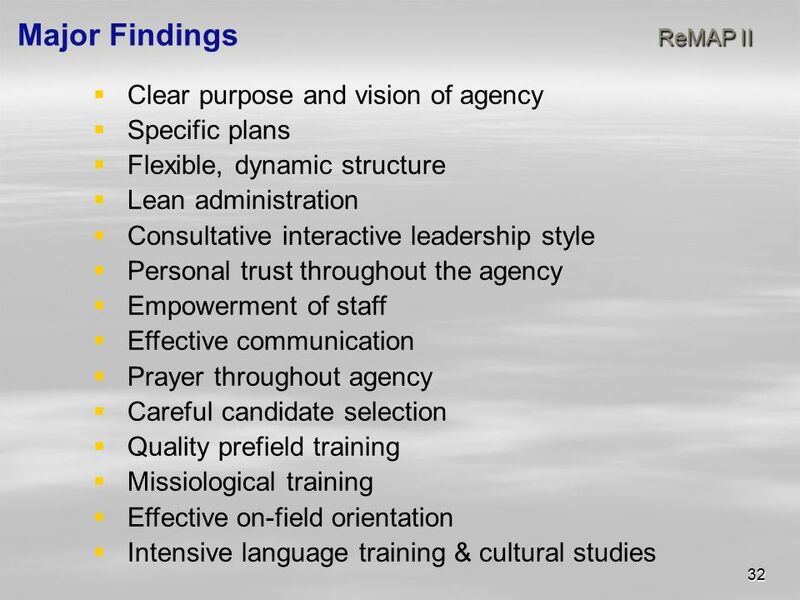 High retaining agencies put even more emphasis on ongoing language and culture studies as well as development of new gifts. 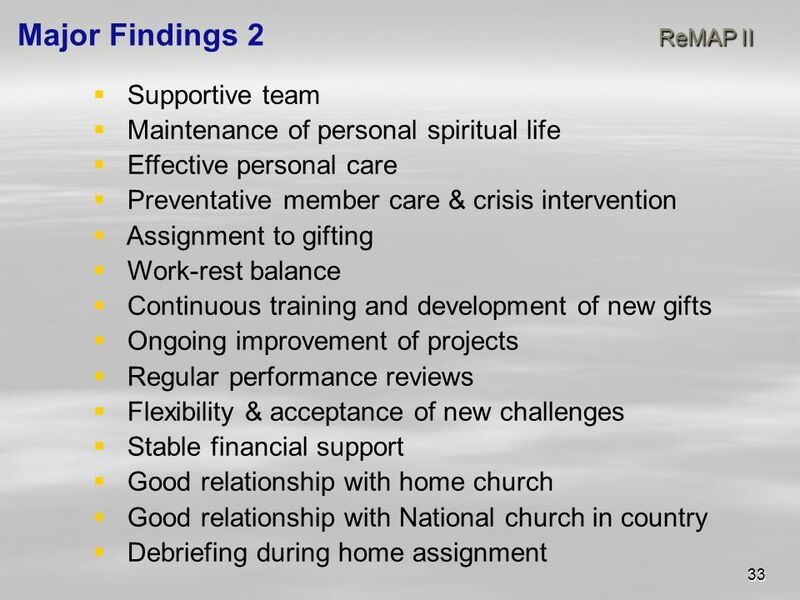 18 18 ReMAP II Good relationships to the people group and the national church found very high rating in all agencies. 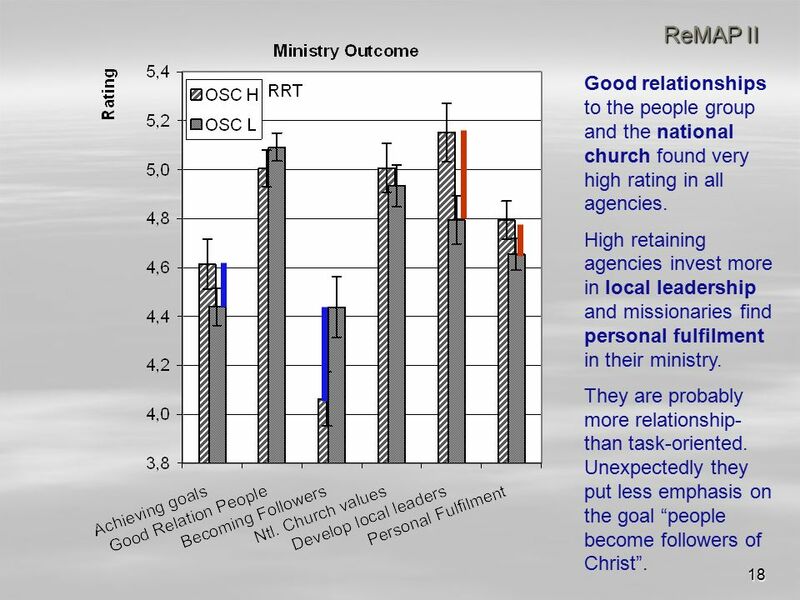 High retaining agencies invest more in local leadership and missionaries find personal fulfilment in their ministry. They are probably more relationship- than task-oriented. Unexpectedly they put less emphasis on the goal “people become followers of Christ”. 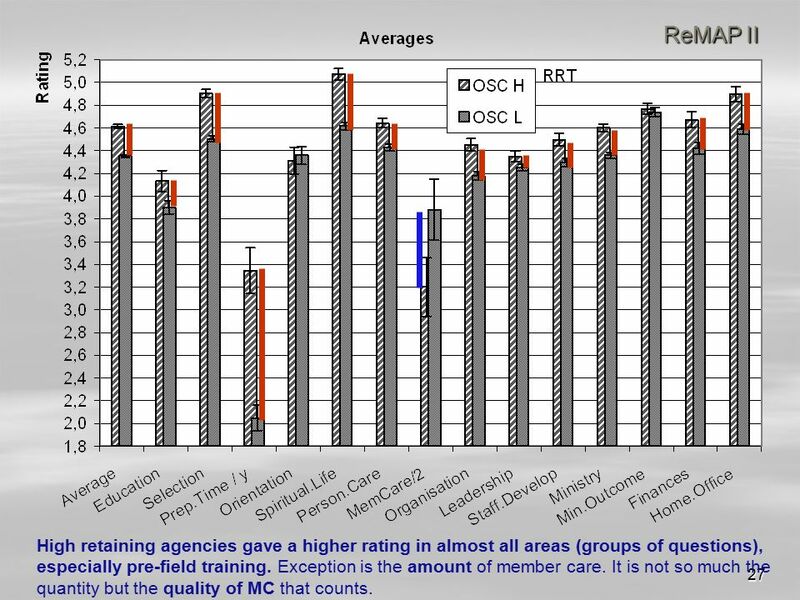 20 20 ReMAP II Little investment in member care (MC) is associated with high attrition. 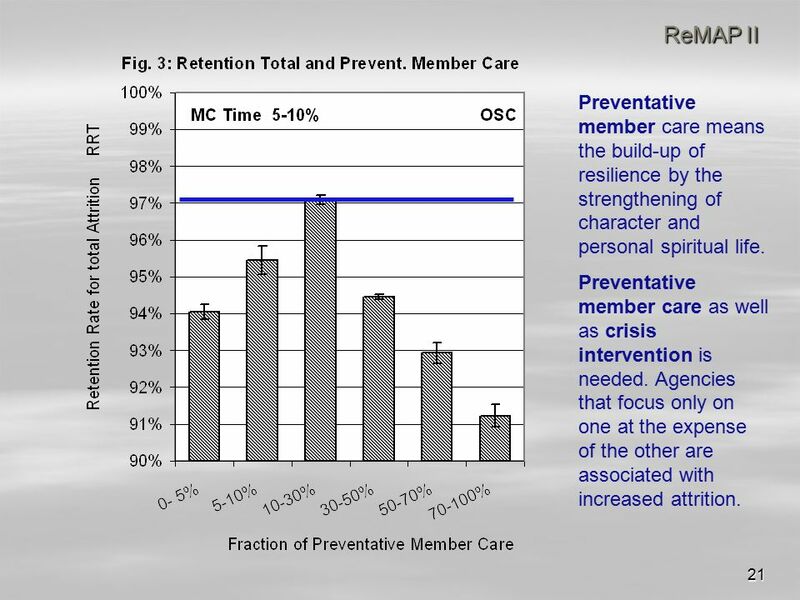 Yet very high investment in member care is also correlated with increased attrition. But it doesn’t appear that MC in itself is detrimental, but that these agencies often do mediocre candidate selection and pre-field training which would prevent problems down the road. In OSC, the optimum is 5- 10% of total staff time at home and on the field invested in member care. 21 21 ReMAP II Preventative member care means the build-up of resilience by the strengthening of character and personal spiritual life. Preventative member care as well as crisis intervention is needed. Agencies that focus only on one at the expense of the other are associated with increased attrition. 22 22 ReMAP II The need for preventative and curative member care is obvious in total attrition, attrition for potentially preventable causes as well as unpreventable attrition which includes end of the project and not going for a new assignment, evacuation, medical reasons, new assignment after retirement age etc. 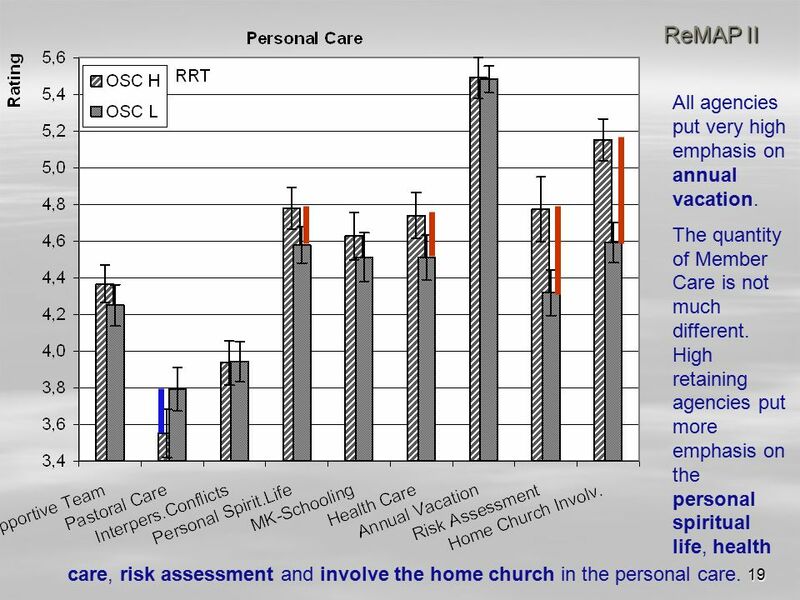 23 23 ReMAP II Newer Sending Countries of the global South show a similar u-curve, yet the optimum for member care is at a higher time investment (10- 20% of total staff time at home and on the field) as they are relational cultures. 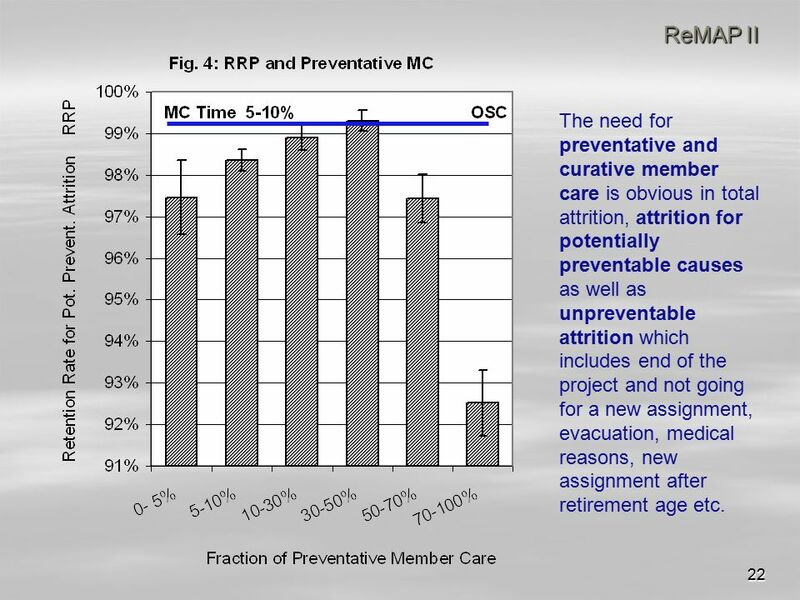 24 24 ReMAP II Preventative and curative member care is needed in NSC agencies too. 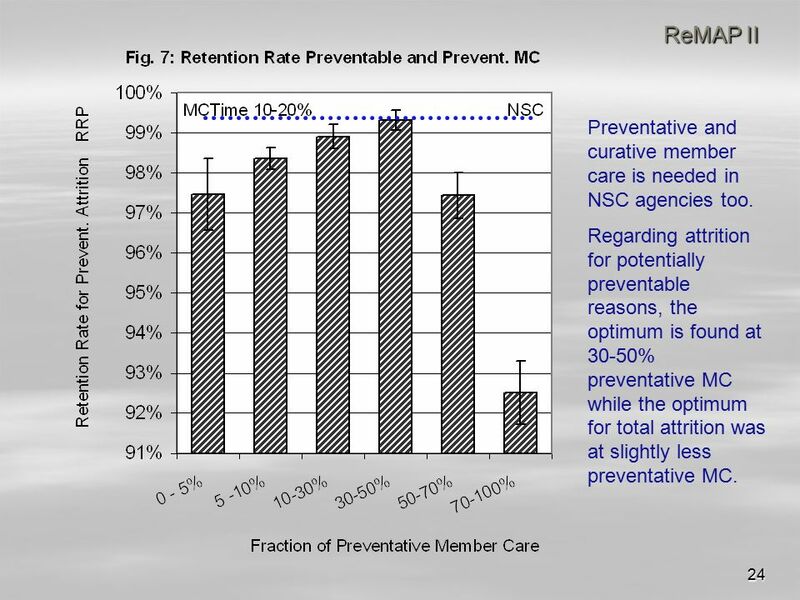 Regarding attrition for potentially preventable reasons, the optimum is found at 30-50% preventative MC while the optimum for total attrition was at slightly less preventative MC. 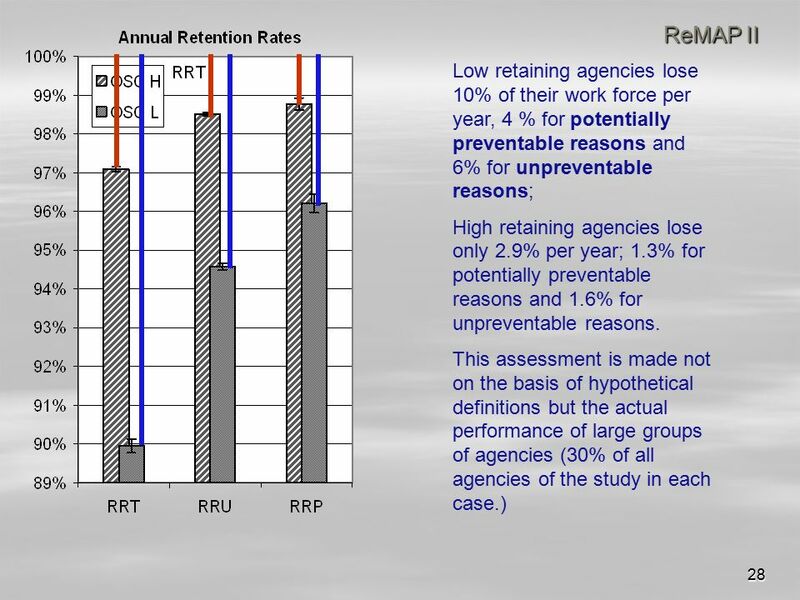 26 26 ReMAP II The agencies’ home office rate their own activities highly. 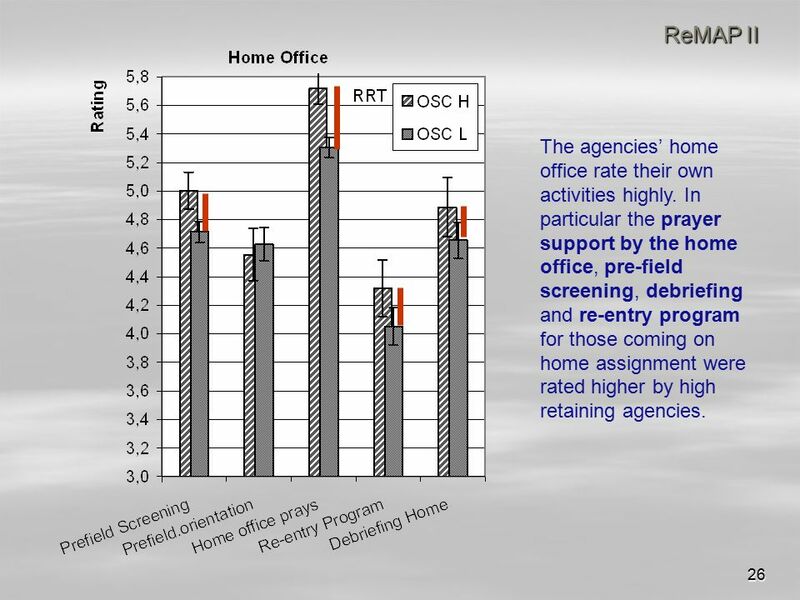 In particular the prayer support by the home office, pre-field screening, debriefing and re-entry program for those coming on home assignment were rated higher by high retaining agencies. 27 27 ReMAP II High retaining agencies gave a higher rating in almost all areas (groups of questions), especially pre-field training. Exception is the amount of member care. It is not so much the quantity but the quality of MC that counts. 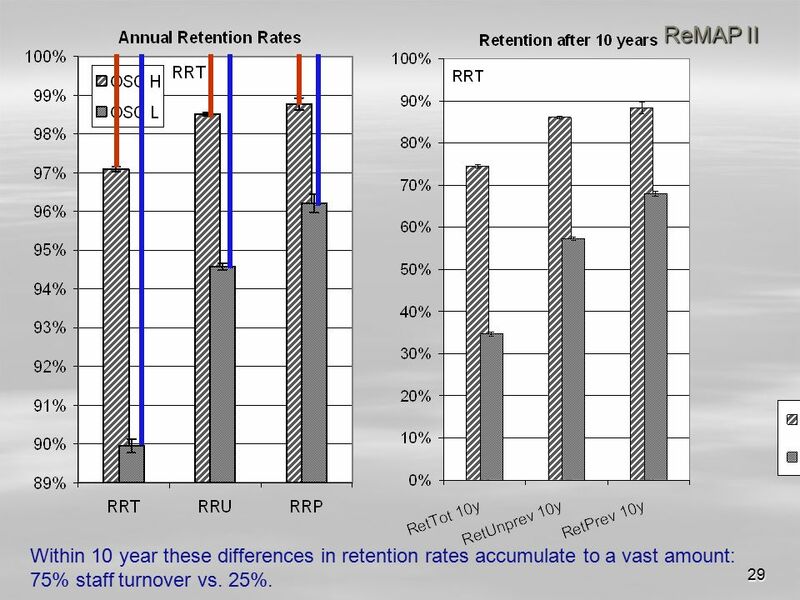 29 29 ReMAP II Within 10 year these differences in retention rates accumulate to a vast amount: 75% staff turnover vs. 25%. 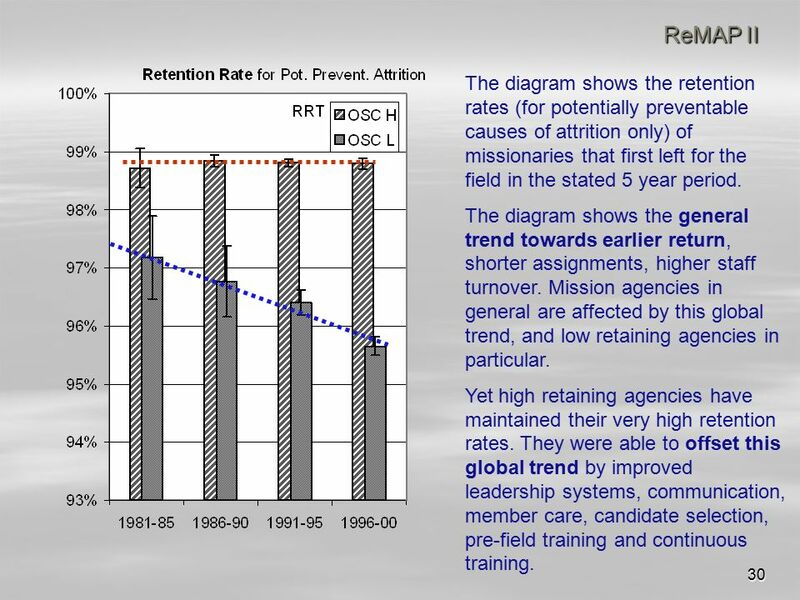 30 30 ReMAP II The diagram shows the retention rates (for potentially preventable causes of attrition only) of missionaries that first left for the field in the stated 5 year period. The diagram shows the general trend towards earlier return, shorter assignments, higher staff turnover. Mission agencies in general are affected by this global trend, and low retaining agencies in particular. Yet high retaining agencies have maintained their very high retention rates. They were able to offset this global trend by improved leadership systems, communication, member care, candidate selection, pre-field training and continuous training. Download ppt "1 ReMAP II – Retaining Missionaries – Agency Practices Older sending countries in Europe and North America." What is CBF? CBF is a fellowship of Baptist Christians and churches who share a passion for the Great Commission of Jesus Christ and a commitment to Baptist. CBF Global Missions …being the presence of Christ. Who is CBF? Getting to know the Cooperative Baptist Fellowship. Global CHE (Community Health Evangelism) Network. AFRICAN NATIONAL INITIATIVES. Preview: ANI National Mobilization Strategy  What is an African National Initiative?  The unique nature of ANI  The four. 2008 COMMITTEE CHAIR/AREA DIRECTOR SUMMIT STEVE MCILVAINPERRY HUNTER YOUNG LIFE. 1 ACI Annual Audit Committee Survey - Global M A R K E T I N G & C O M M U N I C A T I O N S R E S E A R C H Charles Garbowski Research February 21, 2006. Partnership in Missions 4 Diggelmann family. 22/04/ Logroño, La Rioja 24 March 2014 Promoting work-life balance across the EU Logroño, La Rioja 24 March 2014 Robert Anderson Eurofound. Intervention and Review Understanding integrated working P29 1. 1 ReMAP II – Retaining Missionaries – Agency Practices Newer sending countries from Africa, Asia and Latin America. Clinical Governance Dr. Hamda Qotba, B.Med.Sc; MD; ABCM; MFPH. 2010 Offering Results Crisis Relief Fund...………………….... DOVE Africa Transformation Vision… ILC Travel for 2011…….……………… DMI…………………………….……….. Apostolic. MEMBER CARE: STARTING THE CONVERSATION An Interactive Dialogue On Mental Health and Missions Laura Neal, TWR. Back to Europe Movement Sharing the gospel of God's Kingdom in this generation. What does a healthy church look like?. Introduction A computer only produces what’s been put in it. It might be able to mimic life but it cannot generate.